Hello guys! I don’t know about you, but I’m really longing for spring to arrive. Last week we had some really cold weather (around -13°C) so I can’t wait for warmer weather. Last Friday UberChic Beauty released a new spring themed stamping plate called Welcome spring. The plate is full of beautiful floral and Easter themed images and a few of the them are layered. With this plate at least my nails can be in spring mode in this snowy weather! The first design I made with this plate are these cute cherry blossom nails. I started with a white to pink gradient before stamping the cherry blossoms over it. Nothing says spring more than cherry blossoms and I can’t wait for them to start blooming! Another flower that reminds me of spring are tulips, I love having a bouquet at home during spring. What polish is better than Kiss me on my tulips from OPI for a tulip design? I had to use one of the Easter themed images on the plate and chose to stamp these cute Easter eggs over a gradient. 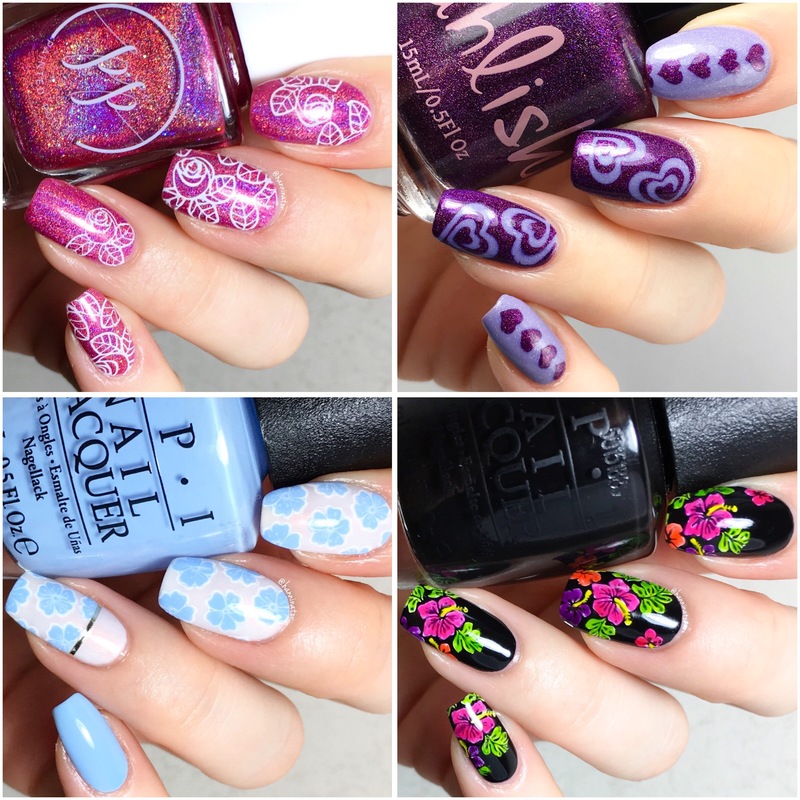 Check out the tutorials for these manis here; Cherry blossoms, Tulips and Easter egg gradient. Yesterday was Cath’s (@withnailsandi) birthday, and to celebrate a bunch of us girls decided to recreate one of her manis. To see all recreations search for #withcakeandi on Instagram. I hope you’re ready for a lot of pictures of the nails I did, because I just love how they turned out! For this design I used Lady in black as the base. I stamped the flowers using White knight and Tropical collection 13 from MoYou London. To fill in the flowers I used the following Color Paints from OPI; Landscape artist, Pen & pink, Magenta muse, Primarily yellow, Chromatic orange and Purple perspective. And here are some pictures of them in matte. And here’s how they looked before I filled in the flowers with the Color Paints. Love them in color but I have to say that I’m digging this monochrome look too. Which version of this design do you prefer; glossy, matte or monochrome? Hi everybody and happy Valentine’s day to you all! 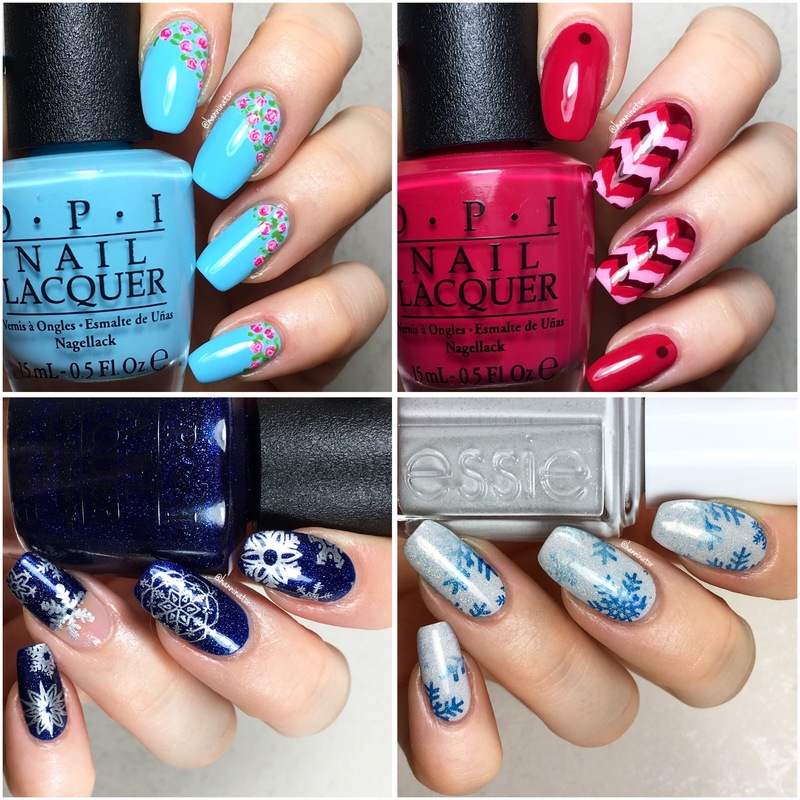 Here are some nail designs that I’ve made this year that fits the theme for today. For details and information about what products I’ve used for these designs make sure to check (and follow) my instagram page. I can’t believe that it’s already December. It’s the last month of the year and how crazy is that!? This year has gone by so fast! Anyway, here are my favorite manis from November. Can you tell that I’m exited about making winter nail art? My absolute favorite of these is the last one with the frosty snowflakes.